1) Remove Pajamas. This first step will require sturdy footwear and plenty of hydration, so lace up your running shoes and take a swig of eggnog before chasing after your two-year-old and wrestling her to the ground. A good pair of earplugs are also recommended, as her shrieks of delight at being chased will be replaced by cries of heartbreak when she realizes what is happening. Peel off her princess nightgown calmly but firmly, while ignoring her sobs of "No, Mommy! Stop, Mommy, stop! Pin-cess dess! Pin-cess dess!" 2) Clothe Child. Using both legs and your left arm to hold toddler stationary, begin dressing her in a cute outfit. If one of her flailing limbs manages to slap or kick you, mutter quietly to yourself, "No pain, no gain. No pain, no gain." 3) Comb Hair. Allow toddler to put on her own socks inside out and shoes on the wrong feet, while you race over to the windows. Make sure windows are secure and all draperies are pulled tightly shut, as the ensuing screams may scare any passers-by into calling the police to report a possible torture occurring inside your home . . . you are now ready to COMB HER HAIR. The style does not matter—just get the hair out of her face and call it a day. 4) Final Touches. Wipe away child's tears, give her a big hug, and tell her how pretty she looks. Hand over her jacket and say with a sweet voice, "You get to put on your new pink coat while Mommy goes potty!" 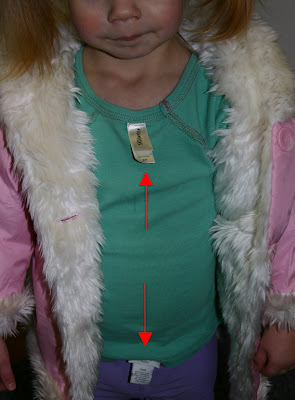 During the 12.5 seconds you are in the bathroom, your child will remove her top and pants, turn them INSIDE OUT, put them on BACKWARDS, then slip into her coat. Congratulations! Your toddler is dressed and ready to go! Laughing and crying here...although my twins aren't verbal enough yet to express their wardrobe preferences! The hair-brushing, on the other hand, is WW3 EVERY SINGLE TIME, TIMES TWO. And I think socks are MEANT to be worn inside out. That scratchy seam along the toe line is a fundamentally bad idea. Child # 6 won't wear socks any other way. Funny post (as always!!) I go throug the same thing every single day and I'm telling you, I need something stronger than eggnog to get through it!! I love the smirk on your daughter's mouth in that picture!! Heh, heh, heh! Oh Kim, you so captured our daily struggles. I merely bring clothing into the room and Peanut and Jelly Bean go running behind furniture giggling.